WebIT provide online ecommerce solutions. WebIT recognise a quality shopping cart system will increase company profitability. This is done in a variety of ways including making the payment button visible without a user having to scroll and highlighting the button for a user to purchase the product. The shopping cart system should also highlight similar products when a user is looking at purchasing a product in order to maximise the user spend. 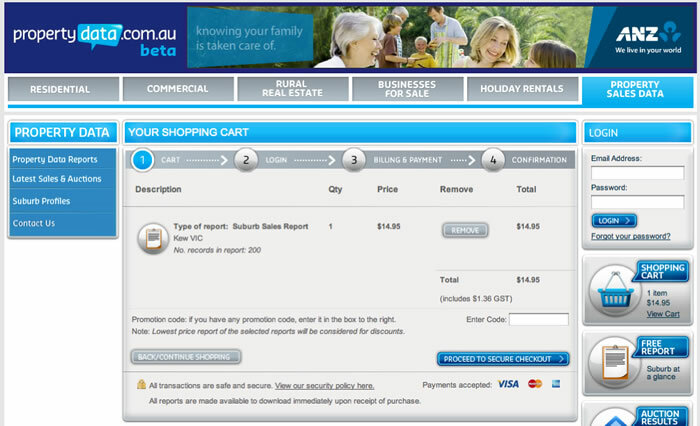 An example of a shopping cart system done by WebIT can be seen at www.propertydata.com.au whereby a user can purchase a variety of property reports using a custom written shopping cart system. The system also includes a backend system to track online expenditure. Using online shopping you can reach a larger customer base then a non online model. Most people want convenience, there is nothing more covenant then online shopping with instant payment. Online sales go straight into a database making it easy to keep track of sales by generating sales report. Creating an online shopping cart system can provide lower ongoing costs then traditional methods.